This is really nice stitching I like the addition of the chain and the knots. wonderful combination of stitches.I love it. 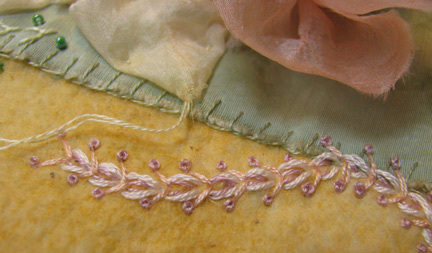 Very pretty chain stitch design, Cyndi. Don't you just love challenges? They really keep the creative juices flowing. Your line of Wheatear looks great!! Julie is right- very dainty. Beautifully done. An attractive seam for a CQ block.